Log into https://gitlab.com/ using our company login details. In the Project path section select the kb group. Select the correct Visibility Level and click Create Project. You should now be able to clone the repository, add a README.rst file and then push. Go to the project Settings, Repository, and scroll down to Protected branches and unprotect the master branch so developers can push to it. 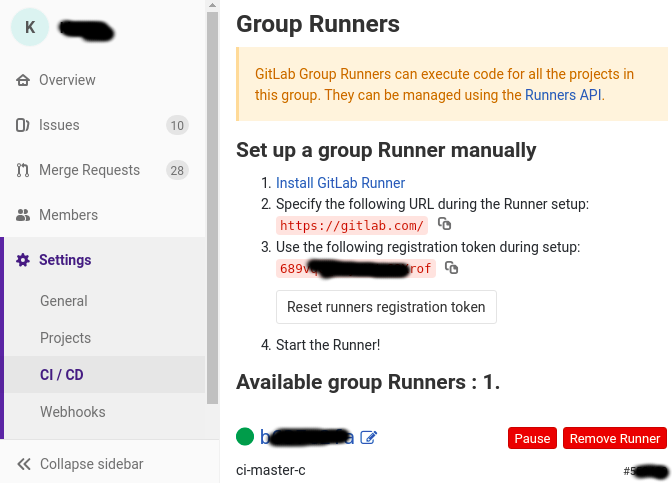 Go to the project Settings, CI/CD, and scroll down to Runners and in the Specific Runners column enable the company ci runner in the Runners activated for this project section. In the Shared Runners column click on the Disable shared runners button. To set-up a runner see Continuous Integration. Register the runner using sudo because you cannot enable the service unless you are root. To set-up Continuous Integration for the project, see Continuous Integration.